The location, named for Captain Charles E. Hoye (1876-1951), founder of the Garrett County Historical Society, offers a view of the North Branch Potomac River valley to the east. The Maryland Historical Society placed a historical marker at the summit during a dedication ceremony in September 1952. There is no vehicular access to Hoye-Crest. 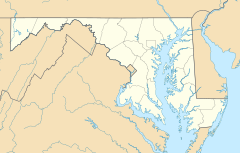 The best route by foot is a hike along the Maryland High Point Trail, from a point along U.S. Route 219 just south of Silver Lake, West Virginia at 39°14′43″N 79°29′30″W﻿ / ﻿39.24528°N 79.49167°W﻿ / 39.24528; -79.49167. The trail ascends Backbone Mountain along an old logging road on Monongahela National Forest property to the West Virginia- Maryland state line. The distance is about one mile each way. The trail then heads north along the state line to the high point. Hoye-Crest sits on private property ( Western Pocahontas Properties), though access is permitted. ^ a b "Backbone Mountain, Maryland". Peakbagger.com. Retrieved 2012-11-08. ^ "Hoye-Crest". Geographic Names Information System. United States Geological Survey. Retrieved 2012-11-08. ^ "Backbone Mountain". SummitPost.org. Retrieved 2008-06-02.